So I ran into an issue with one of my sites not being able to upgrade WordPress except for via manual ssh. And that’s extremely annoying. It was the only one that was on a VPS, so I was curious why the VPS was set up so differently than most of the other shared accounts on the same host. Here’s the reasoning. The difference is whether or not your Apache is running DSO, or SuPHP. suPHP is a tool for executing PHP scripts with the permissions of their owners. It consists of an Apache module (mod_suphp) and a setuid root binary (suphp) that is called by the Apache module to change the uid of the process executing the PHP interpreter. So how do you fix it? Are you getting the WordPress error that refuses to create directories in plugins and upgrade? Having issues where the whole chmod 777 solution (which btw, is a completely stupid solution since it opens you up to all sorts of bad things) isn’t working? This will fix the entire issue because it basically defines your environment and forces the masking to be correct. Ahhh.. phew. Another fix. If there’s one thing that I despise, it’s when sites move slowly. Like they drag. And when it comes to blogging software, these usually are hella draggers. But fortunately there are a few ways to speed things up without actually giving up as much. The biggest one that you can ever focus on is caching. Caching basically means that instead of telling the server to dynamically process something, it has a statically saved copy somewhere that it basically reads off. That shaves ticks off the seconds when you don’t have to ask the CPU to figure out what some variable is saying. And with most database driven applications, there are two methods to do this. DB Cache: This is less well known but is actually an entirely brilliant design. Basically, it makes the assumption that you’re going to be querying your database a lot, and thus it saves those queries statically and can shave off seconds for you if you have large queries to make. This basically means that it’ll be slow the first time around, but not so much the next if you happen to repeat things a lot. Very useful in that sense. WP Super Cache: WP-Super Cache is one of the most well-known in the WordPress community. It allows you to cache the pages themselves after the first time they’re built into static calls. This means that instead of reading directly from the database and generating the page, it creates the page the first time and doesn’t change out that copy until there’s a new one to change with. This basically allows the first person to read it to have a bit of slowness, but after that the page is already kept around. As you can see, there are at least two different caching methods that you can implement to improve the quality and decrease the time latency. And in the web world, time latency is everything. Have been on WordPress 2.7 for a while now on one of the blogs I run and for the life of me, I couldn’t figure out how the heck there were some user profile pictures. I figured it was installed in the software somewhere, but didn’t see any documentation mentioning it. So I asked a friend of mine if he knew of anything that I was missing. After all, I’ve been swamped with the crazy life of startups and my free time has been dedicated almost entirely to Merchant’s Mirror. Dang, and I missed out on this? 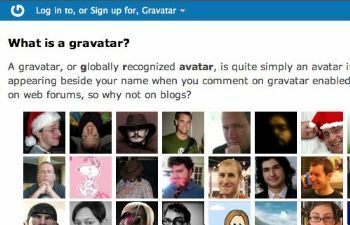 Automattic, the people behind WordPress had come out with a global avatar system that basically is queried from their servers and hashed out by email addresses. So that you basically don’t have to upload your picture everywhere you go. Brilliant idea, although it is another bit of traffic for your blog to get hit with if the user pictures aren’t cached somewhere. Outside of that, it’s actually pretty smooth. I like the idea of it and it definitely plays well as far as I can tell. And now, I have pretty pictures I can set up all over the WordPress arena without having to upload separately. Nice. UPDATE (3:20PM): Sorry about that. TD pointed out that Automattic didn’t come out with Gravatar. They acquired them. I found that SixApart indeed has a sense of humor when playing upon the whole “bailout” things going on with our economy. What’s even more interesting is that they understand that finally, mainstream journalists are finally seeing the light of day, when it comes to social mediums. Many of them have finally signed on to Twitter, or Tumblr, or even Friendfeed for some. But none of them are taking the plunge into writing for writing and perhaps making some money on it. And that’s where they come in with the TypePad Journalist Bailout Program. They know that you love to write. But someone’s got to put food on the table. That someone is you. Now, perhaps you won’t make anything, but any bit of pennies is still more than empty pockets, right? So get your butts down to TypePad. This limited offer will end soon. I truly wish that blogging platforms would introduce DNSBL lists. DNSBL are usually referred to as blocklists, blacklists, or blackhole lists. Basically, they’re lists of known spammer IP blocks, and they basically deny access if there is any access coming from those addresses. There’s a good reason for this from a technical perspective. If you actually host multiple blogs, then one of the problems that becomes an issue on your server resources is that with each comment/trackback spam that is logged, that’s a little bit of your resource taken up. If you calculate out the additions of each insignificant portion, all of them added up become a lot of wasted cpu cycles that could be used for more useful things. Noted, if you block with a .htaccess or what not, then you would still be committing some resources to processing ip checks. But this would be far more efficient than actually running the complete spam through your blogging platform, then marking it as spam. That makes it inefficient. That’s the inherent issue with blocking spam at the plugin level. And currently with the TypePad Anti-Spam and Akismet, I have to say that it does drive some serious cpu cycles that I could be using for other blogging efforts. It’s that time of year again. And Sue’s done a fantastic job at coordinating the event. Yet again. Kudos, Sue. As always, you’re awesome. I had thought I’d be more involved this year, but with Firelace launching our product, Merchant’s Mirror, during the same time, my time has been limited. But in any case, October 16 and 17th are the dates for this year. Conference day is the 17th and the annual barbeque at Hoggards, and if you want to go to a dinner, then the speakers will be in on the 16th. Those that are signed up for the video tour will be doing that in the afternoon of the 16th. On the 18th there was supposed to be the BlogHer Road Show, but for whatever reason, they canceled because not enough people signed up, or resources or something. Personally, I’m just a little annoyed by the “month” out cancellation instead of giving enough notice since it threw the people that already had non-refundable tickets holding the ball. Sorry, but while I agree that conferences are planned by human beings, I personally found that it to be somewhat bad form. Fortunately, a buddy of mine, Dave Slusher of Evil Genius Chronicles and Kelby Carr of Type A Mom have decided to make the best of it and setting up sessions and workshops on short notice and developing BlogHer Alternative in a month’s time. Whomever said that bloggers aren’t a dynamic bunch, has another thing coming! Anyhow, I’m glad a bunch of bloggers got together and said… hey… we’re going to be there anyways. Dave, you know that you got me working if ya’ll need me. I’ll be there. Tipjoy is a new Y-Connector startup that basically sets up tipping people for their work and content, instead of having people write content and if you enjoy it, to click their ads. There are a lot of reasons why you should tip instead of click ads. The way of the Internet is changing. What’s also interesting is that you can tip as much or as little as you want (starting at a nickel). The way this works currently is that you can tip sites that are there or are not based on URL, or email or anything. So any site or person can technically get tipped. There are a few missing catches for this, but for the most part it works pretty well. You pay through PayPal (minimum increments of $5.00USD) and right now, you can either donate your earnings to charity or buy an Amazon gift certificate with it. Currently the tipjoy team is working on trying to get past the legal issues so that you can also withdraw your money from the system. I’ve personally run into a couple logic issues where I wish they were caught. It wasn’t “wrong” but more like it didn’t ask or set an upper limit with a catch. It’s also sort of weird that websites do not have their own tracker, but are tied directly into whomever verifies account. Outside of that? Very neat idea. Remember when there was the WordPress plugin for FriendFeed and how it imported your comments? Well, it seems like there’s the same that goes for Movable Type. What’s neat about this is that it basically will repost the comments from FriendFeed directly into your blog as comments. This makes the conversation more worthwhile since you’re able to read transactions that not only happened on the blog, but on FF without having to go track it down on FF. Perhaps a fluke, but at the time that this plugin actually was installed, I noticed a tremendous shift in MySQL queries to the blog. Not sure if this happens with others, but I would definitely keep an eye on it and report it to the author (Mark Carey) if it still exists. If you’re checking out FriendFeed lately, you’ll notice that you can basically feed it all of your blogs and rss feeds along with all sorts of other social services. It’s basically a one stop shop where people can comment and like or not like your feed. Well, sometimes the conversation isn’t heard back on the blog, if someone posts on the topic in FriendFeed. No big deal. FriendFeed Comments now consolidates those commentary back to the blog itself. This makes the conversation a lot more interactive and makes sure that you hear about your posts one way or another. This plugin itself is for WordPress and is compatible from version 2.3 to the latest and greatest.